We're entering deep into the heart of tie-in country for the third VS one shot leading to the upcoming wedding issue in Batman #50. I've personally had an alright time with moments of the previous two VS issues. That's mostly because I get to see Batman and his family members interact, who've been largely ignored throughout most of King's run. Instead, he's been spotlighting Catwoman repeatedly, to the point I'm shocked King himself isn't writing that title when it releases its new #1 shortly. Anyway, let's peek in on how Barbara and the Riddler, complete with question mark carved into his chest, are taking the news of the Bat/Cat Wedding. Join me. 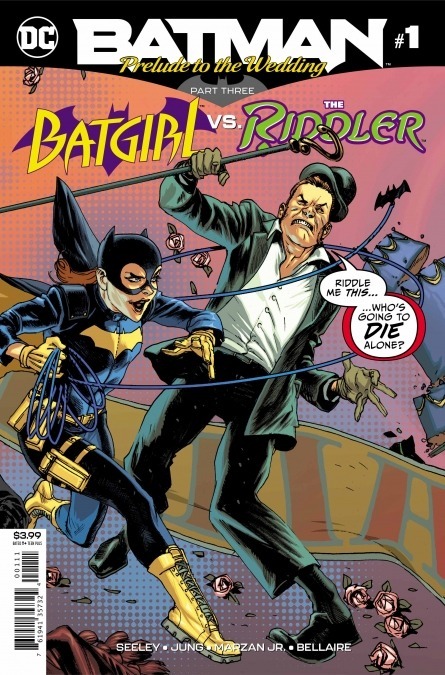 Things start with a tape recorder on a rooftop, as the Riddler lures Batgirl into his latest word trap, with the twist this time it's on her turf ... Burnside! Not a bad cold opening, although my guess is Riddler went with the Walkman because a Discman would skip grappling around the city. From here its right to some strange foreshadowing for the story with Black Canary, before Barbara catches back up with present-day events, arriving at the aftermath of a kidnapping/robbery. 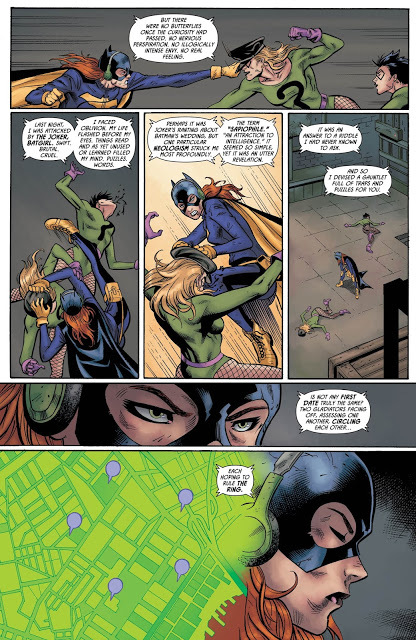 See what this all boils down to is the Riddler has four hostages hidden around the city that he's asking Batgirl to save. 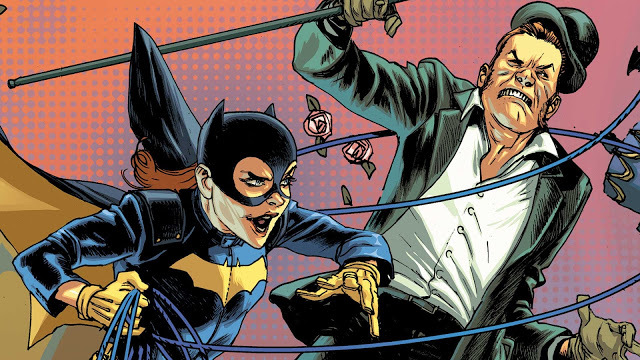 It's set up in a way to see if she'd be a worthy suitor for the Riddler, who finds himself, in a very roundabout way, suddenly falling for Batgirl, a la Batman falling for a former villain in Catwoman. It all comes off a touch creepy, but not really in the horror kind of way Seeley seems to be going for. I think a lot of the reason for this is the art doesn't really give the book the horror feel it seems to be vibing for, and with the more cartoony Batgirl style, it basically feels stuck between two worlds without capturing either. 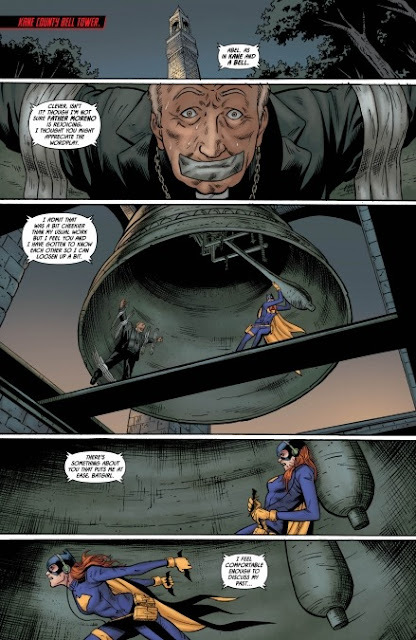 Long story short, Batgirl solves the four riddles, rescues the four hostages, and knocks Riddler off a roof into an awning down below, just in case anyone was worried about his fate, as he skedaddles off into the sunset. In the prologue, a beat up Riddler is confronted by Harley who wants to know where Mr. J is ... or else! Overall this was an OK issue. If you happen to be collecting these for the connecting covers then, by all means, keep going, but as a whole, this lacked the 'family' connectivity to the actual Batman wedding the other two had. The other issue being, the Riddler's plan was basically all for nothing. By the end, it seems he almost comes full circle to decide they wouldn't be a match anyway, but I could be misunderstanding how this plays out, considering the two characters don't actually exchange dialogue between each other, and its all played out mostly through a tape recording. Come to think of it I like the idea of this issue a lot, but it didn't play out as well on the page as intended if you ask me. The art style just really didn't match the vibe the book seemed to try and be going for. 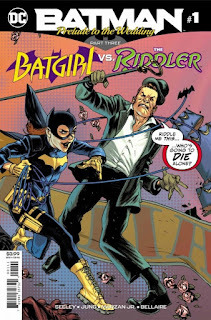 By itself, the art looks great, for a general Batgirl-centric title, but to me, it's not for the Saw/Horror vibe this script almost called for. If the art was a better match for this type of story it would have went up at least a point in my book. The Prelude to the Wedding issues overall have been passable because there have been a few times each issue that you can look back on and think, "that was a nice moment for the Bat Family". However this issue is missing any of those moments, has little connectivity to the wedding really at all other than just being casually mentioned, and art is off compared to the book's tone. It's mostly passable as a whole but bigger Batgirl fans than myself may find more enjoyment in it. Haven't read burnside batgirl in awhile but it look like the character is still as irrelevant as she always is. This issue is a waste of money and time this did not need to be in this prelude series of books. Riddler is still and always be a Joke. No matter how you dress him up like "Jokes & Riddles" Workout riddler. Worst prelude to the wedding issue yet! 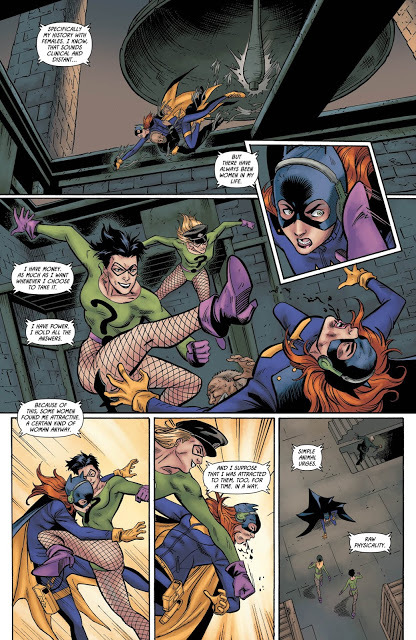 and yet, best Riddler and Batgirl we've gotten in a long time.